Whether they're sailboats, skulls or saddle shoes, there's more to embroidered shorts these days than the tiny whales of previous generations. 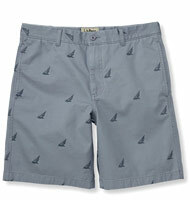 These quirky critter shorts offer a pop of personality to otherwise simple chino shorts. Of course, they do draw a healthy amount of attention to your legs, so you may want to hit the gym. Sailboats. Garment washed 8.5 oz cotton. Skulls. Faded chino material with flap coin pocket. Saddle shoes or golfers. Washed lightweight cotton. Hula girls. Textured cotton with a 9" inseam. Other "critters" we encountered: Tiki masks, marlins, large mouth bass, martini glasses and ducks.